In this rip-roaring dungeon adventure, genius inventor Wily Snare must journey into a dangerous underground maze to find a mythical beast. Thanks to a crew of misfit treasure-seekers, Wily Snare has assumed his rightful place as King of Panthasos. Wily knows how to be a great trapsmith―devising and building various contraptions to keep plunderers at bay―but he has no idea how to be a good king. And he hasn’t escaped his past. Stalag, mage who once kept him locked away, is amassing an army of stone soldiers to seize the kingdom. Wily’s only hope is to tame a lair beast, a giant creature that’s the only chance against the evil wizard’s army. But first, Wily and his friends will need to survive the journey to the strange and deadly “Below” where the lair beast dwells. 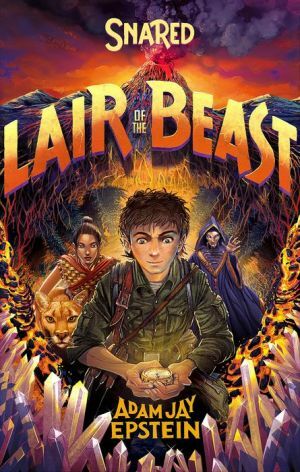 Snared: Lair of the Beast is the second book in a fantasy adventure series from bestselling author Adam Jay Epstein. “Fabulous characters and a unique mythology combine to create something really wonderful. Snared will ensnare you.” ―Michael Scott, New York Times bestselling author of The Secrets of the Immortal Nicholas Flamel series.